I am not much of a "rice" person. I am supposed to be one since I am ethnic Southern Chinese, we are supposed to be a rice eating culture. In old China, rice grew in the south while wheat in the north. 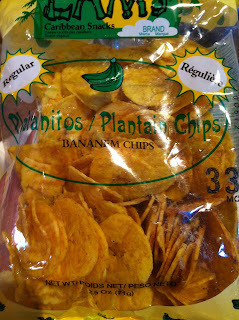 It dictated the starch of each of the group. I always love noodle, any noodles, hot, cold, soup, pan fried or simply tossed with oyster sauce and shoyu. It is my ultimate comfort food. Here is a recipe that I made from time to time in the summer, it requires a little bit of cooking - making the noodle. There is a bit of chopping and cutting, otherwise it is a simple recipe. It is a great summer dish for a pot-luck. This is why I am making this! My big Samoa braddah introduced me to a Chinese BBQ Hiep Thanh BBQ and Deli in Brooklyn Park, North Minneapolis. It is ran by a Vietnamese Chinese family. The nicest people and great food too! They makes Char Sui, Chinese roast pork. I got some for this salad. You can always replace the meat with rotisserie chicken. 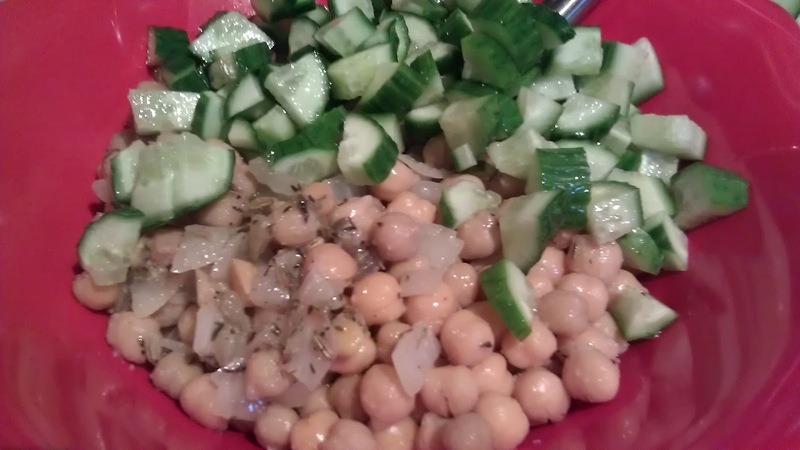 I make this vegan sometime with no meat at all. I would however replace the meat with julienne carrot, pea pods and celery. As with the dressing, you will notice I am using a few South East Asian herbs and spices, my other "Southern" root. Lemon grass, galanga and keffir leaves are all favorites of Thai, Indonesian and Malaysian cooking. I am very luck to have a keffir plant. If fresh is not available in your Asian store, check the frozen food section, you may find it there. You will also notice that I am not salting the noodle or the vegetable. 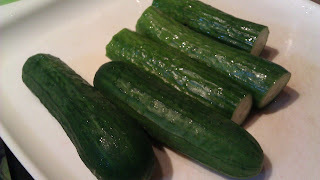 I found the salt draws too much moisture out of the the vegetable. I would rather keep the vegetable crispy and let the dressing carries the saltiness. It will balance out once you have everything tossed together. If you decide to make ahead, separate the noodle vegetable mix and the dressing on the side, toss when ready to serve. If you are going to make it a day ahead, please chop and mix in the herbs with you are able to serve. The herbs will loss its flavor if they are cut and store overnight. 1 lb bag precooked Hong Kong style Shanghai noodle, you can also use Filipino Pan cit here too. 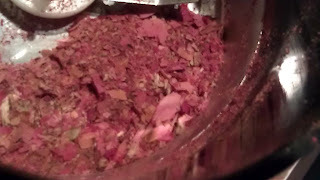 1/2 lb (about 1 cup shredded) Chinese Char Sui - BBQ pork or other kind of meat of your choice. shredded or julienned. 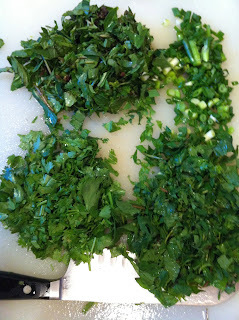 1/4 cup roughly chopped mint, save a few sprig for garnish. 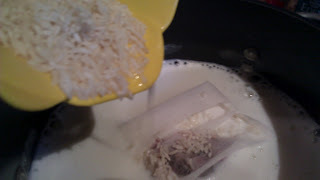 1 tsp grated lemon grass, I am using frozen product from the Asian store, you can find it in the frozen vegetable section. 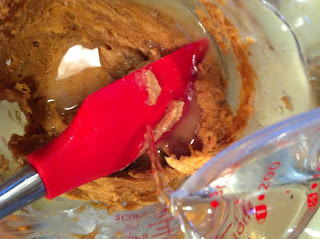 Add in juice of 1/2 a lime, it will be become very thick, this is why I am using a spatula to mix. 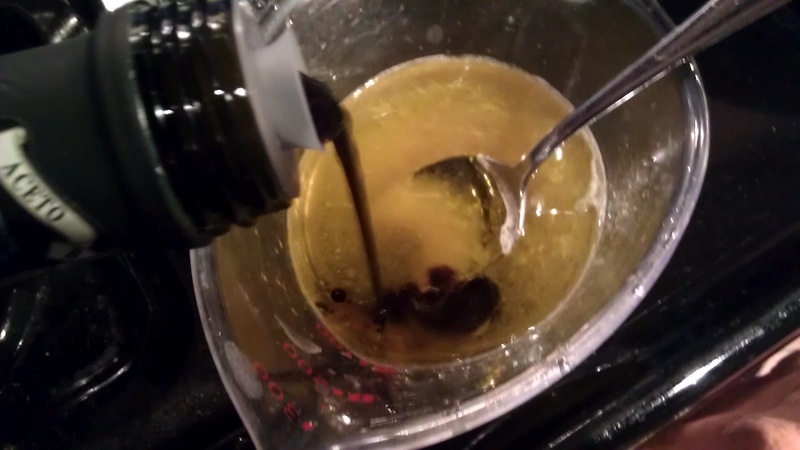 Slowly drizzle in the vinegar, keep mixing. Finally whisk in sesame oil and shoyu. Taste and season with pepper or more shoyu as need. It is OK to have it a bit saltier than usual since we are not salting the noodle and the vegetable. 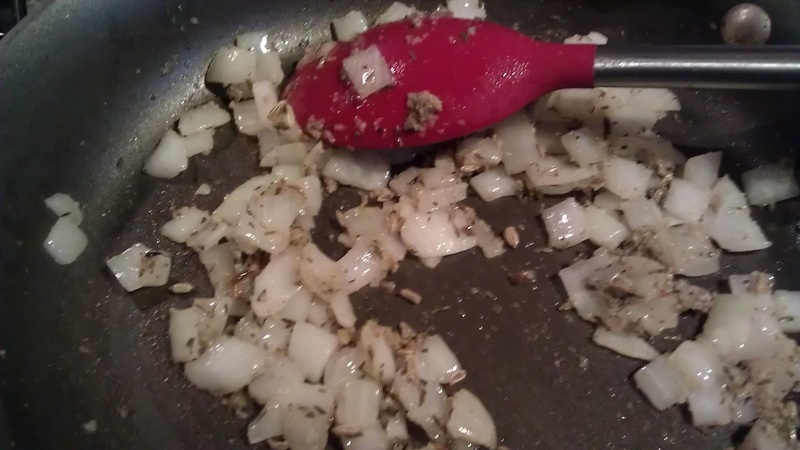 Correct seasoning to taste, you may want more sugar or salt. In a large pot, bring to boil 6 cups of water. Drop the noodle in the water to reheat and "wash". Drain and rinse the noodle under cold water. Unlike Italian cooking, we need to remove the starch from the Asian noodle, it will have a crisp feel to it. Drain and set aside. 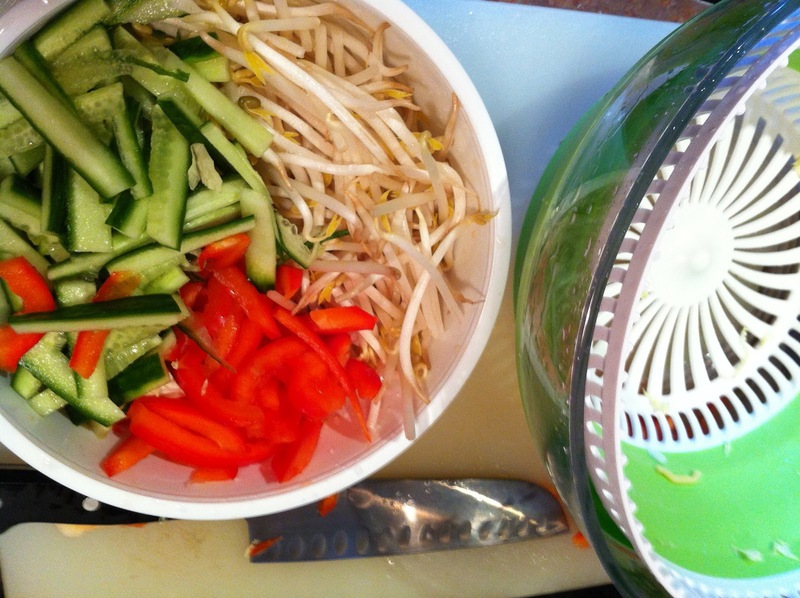 ﻿Place bean sprouts, cucumber and red pepper in a salad spinner, remove as much water as possible with couple of "spin cycles". Repeat the same process with the cabbage to remove the water. 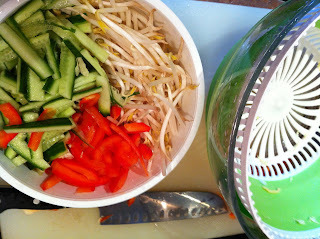 Place the noodle and cabbage in the large bowl, pour in 1/3 of the dressing, toss to coat. Pile the noodle in a large serving bowl. Drizzle the rest of the dressing over the top. Chill in the fridge for about an hour. 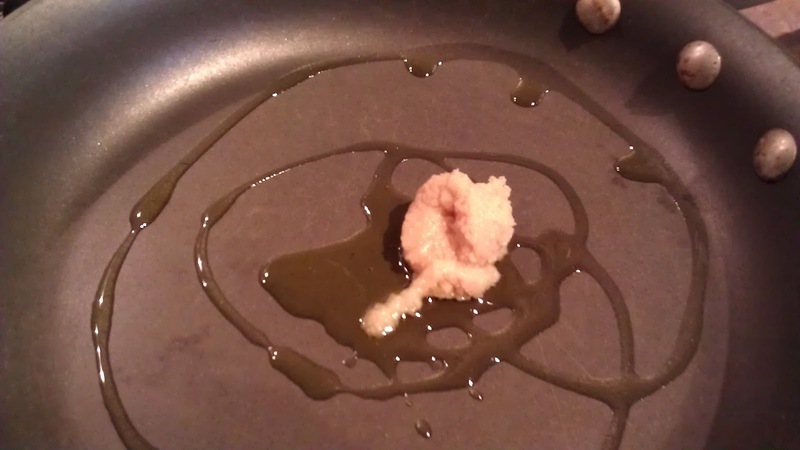 You can have the toppings served on the side or sprinkle on the dish just before serving. Garnish with a few herbs. Serve 8 as a main course for good eater. You can always half the recipe. The dressing can be keep in the jar with a tight lid in the fridge. Use within a week. 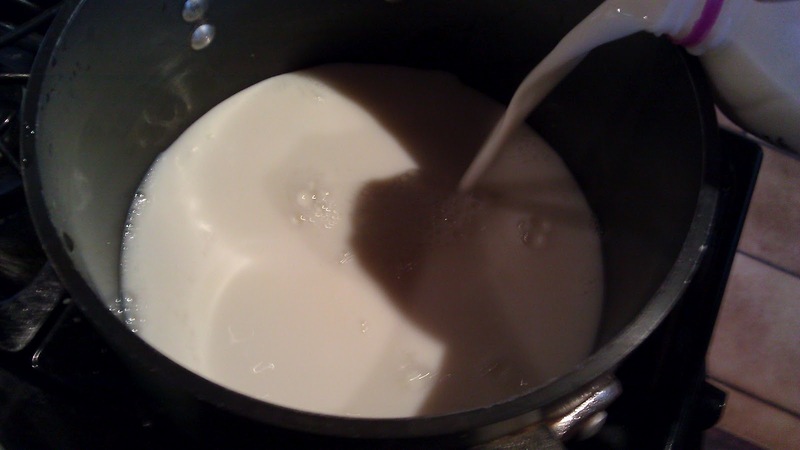 Classically, the spices are usually are simply added to the milk whole and left in the pudding. I don't really care for fishing all the spices out nor enjoy having little hard pieces of cardamon in my mouth. 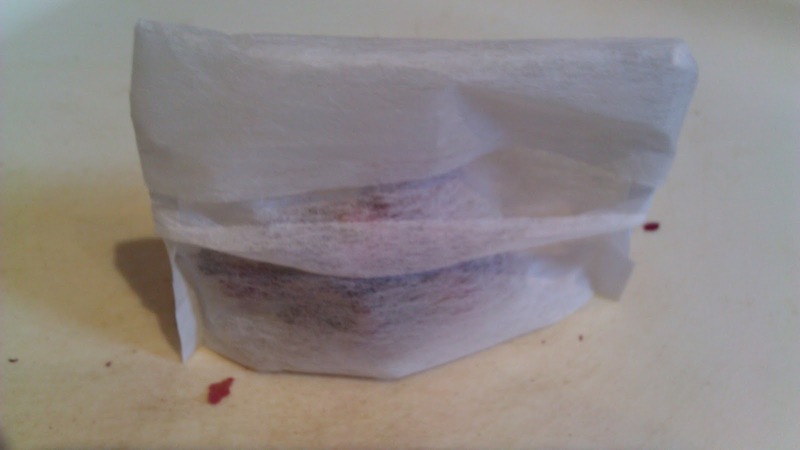 I prefer to have the spices in a bag so that I can easily remove the packet when the cooking is done. I also added in dried roses to add more floral note. However if you prefer less, just skip adding the roses to your spice pack. As with the roses I use here. 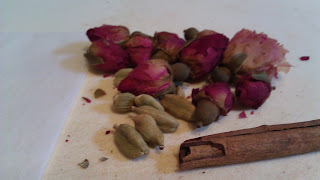 I am using dried roses. Please make sure they are for consumption. I am using roses for tea. You will find them at any co-op bulk section. You can also get them from tea shop, please make sure you only want the roses without tea leaves. 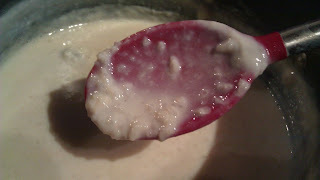 Classic Indian rice pudding with rose petal "dust"
1/4 cup basmati rice, washed and drained. Place the spices in a tea bag or tea ball. Bring to a boil, low heat to medium low and let it simmer. Stir constantly till the liquid reduce by half, about 1 hour. Please remember to stir or it may burn on the bottom. Check the consistence of the pudding. 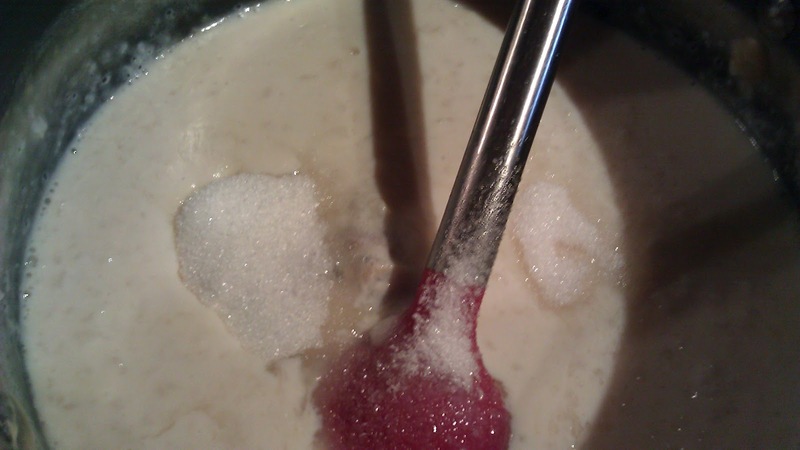 Cook until the mixture has a thick porridge consistence. Remove spice pack. Add sugar, stir till dissolve. Bring the pudding to simmer for additional 5 min. Keep stirring. 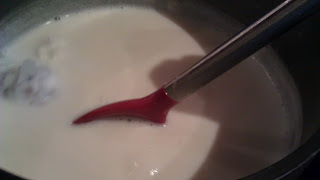 When it's thick and coat the back of the spoon, add 1 tbsp rose water. Cover and ready to serve. 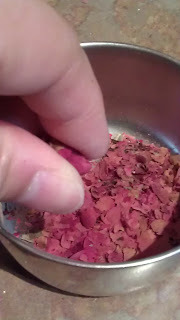 Ladle into small bowls, sprinkle with rose petal. Can be serve hot or cold. If you prefer a cold pudding. Transfer the mixture to a large bowl. 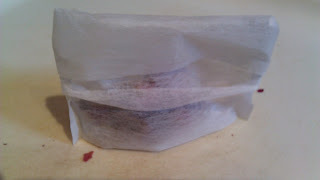 Press a piece of plastic wrap onto the surface of the pudding. This will prevent a film to form. 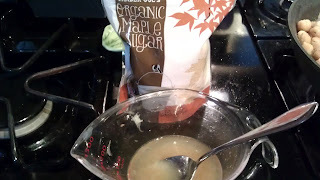 Make 12 small serving or 6 large one. 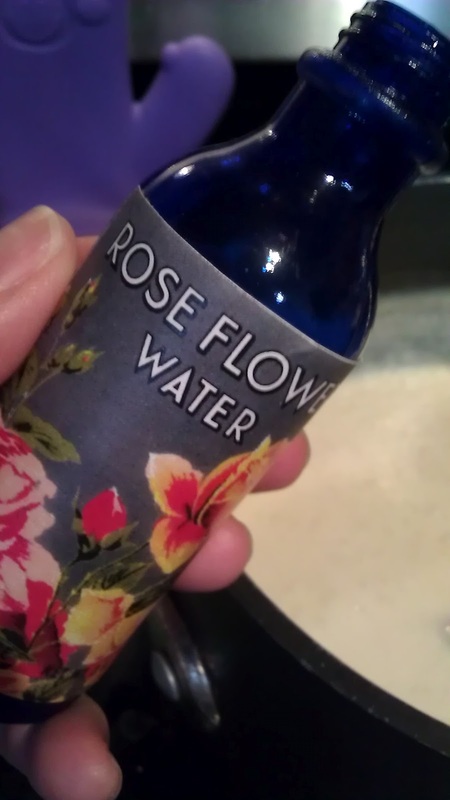 Remove any stem from the rose blossom. Crush the leaves as much as possible. 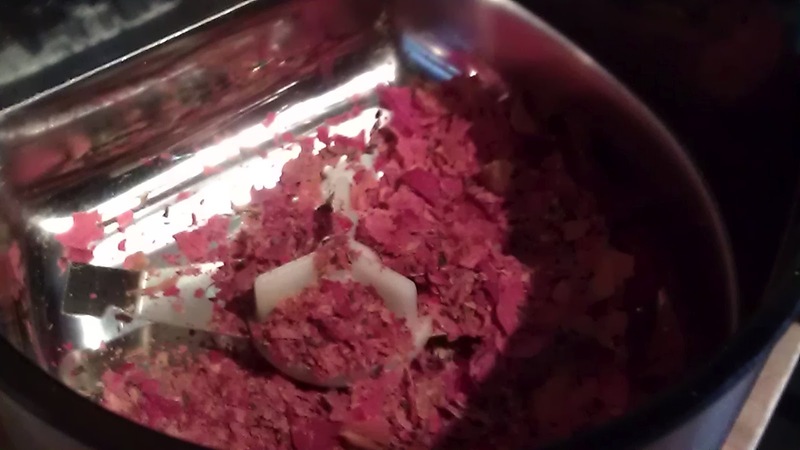 Place the crushed petals in a spice grinder. 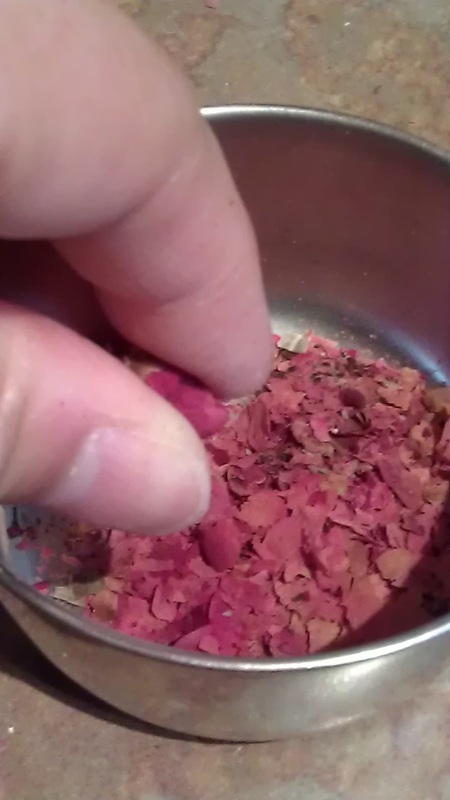 The rose dust can be store in an airtight jar with the rest of the spices. There is no question summer is here. Our temperature hits 98 degrees F today. When I left my office, my car is really 102. With 70% humidity, this is no island weather. I would say this is closer to summer in Central, Hong Kong verse Honolulu or Singapore. Summer is also a busy time. Mr Wonderful and I try very hard to get to his lake place in Northern Minnesota. It's peaceful and we enjoy taking the boat out on the lake and spend a day of doing nothing. Cooking is always an issue at the Lake. It's a very small place and I try not to "heat" up the place too much. We tend to grill a lot and use the grill burner for most of our meal. He is always thoughtful that he would do all the cooking. Lake time is supposed to be "do nothing" time. I need to come up with a few things that we can "grab and go" for picnic on the boat. 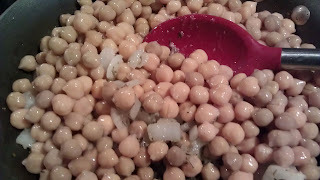 Toss in gabanzo beans. Lower heat to low and let it cook for a few mins to let the liquid from the bean dry up. Season with salt and pepper. Remove from heat and let cook for 5 mins. Drizzle the dressing over the salad. Mix well. Refrigerate the salad for about an hour to let the flavor blend. 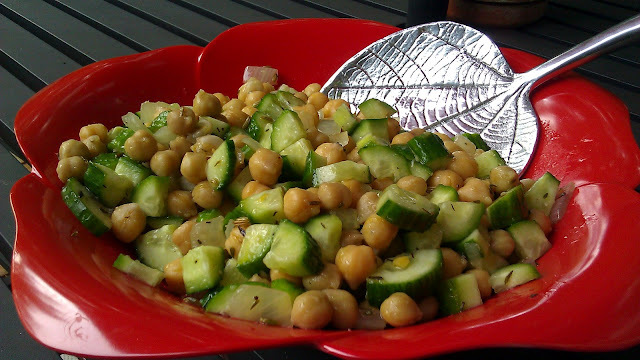 To make this more filling for non-vegetarian, add 1 cup of chopped store bought rotisserie chicken with the cucumber. 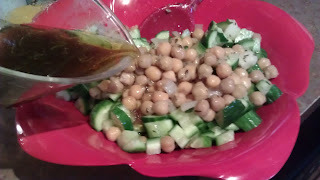 Drizzle with dressing and refrigerate.